The "Take It !" came from the eye catching strength of the shadow on the wall due to the angle of the sun. 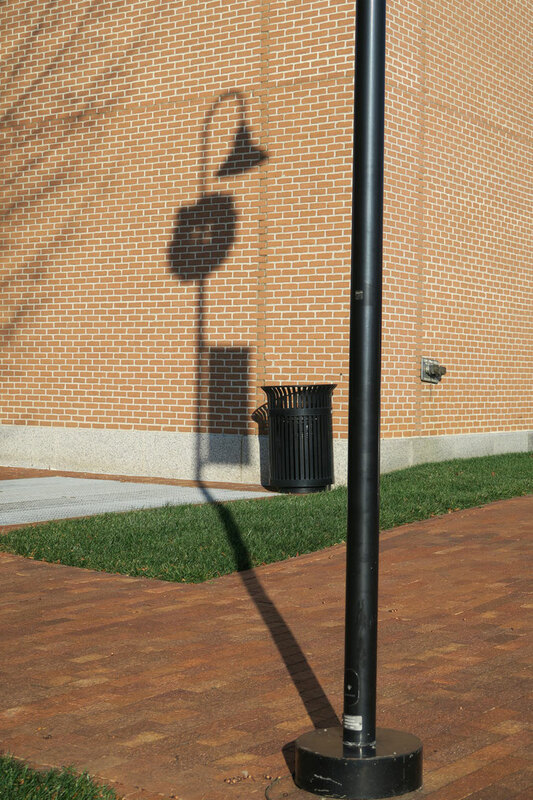 That the shadow fell on an almost blank brick wall gave a great canvas for this image of a light, banner and a wreath. It all came together with a refuse container with its contribution of a small bit of shadow. The fun of this photo is in knowing this gathering can only happen when the sun is out and at a certain time of day, which changes a small amount each day. The After Take: This is yet another sample of a shadow portrait painted by nature. Here is hoping some portraits like this, that are near you, jump out, like this one did, and demand that you take notice. This one reminds me of a Kaleidoscope. This is a pretty picture, the wreathe really adds that Christmas touch. Could you tell what time it was from the shadow? Haha its like one of those ancient clocks. Hey everyone just wanted to wish you all Merry Christmas, Happy Holidays, etc. This would make a cute desktop background. Love it!